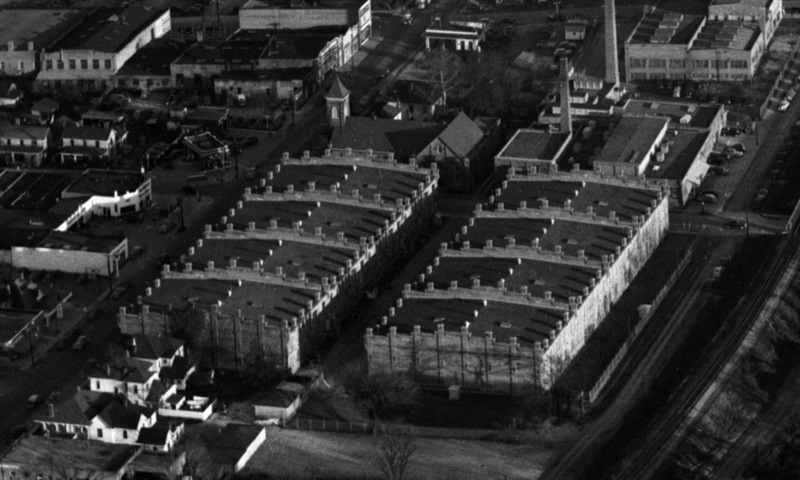 American Tobacco / Liggett warehouses, built in Durham's unique style, that became Durham's first modern adaptive reuse project. The Watts and Yuille tobacco warehouses were constructed in 1904 and named after two executives of the American Tobacco company. The warehouses are very similar in pattern to the Toms and Hicks warehouses on Duke St. (West Village Apts. ), both sets of which followed a similar pattern to the earlier Walker Warehouse, which had been built in 1897. 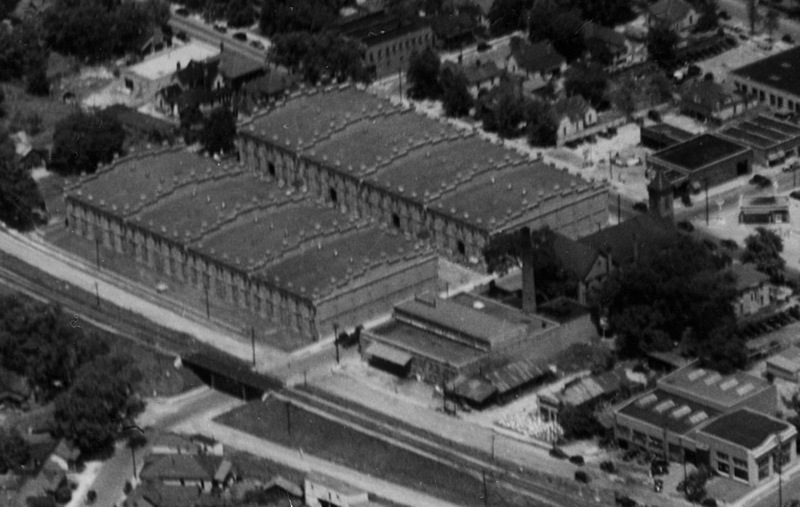 The architect that designed these warehouses is unknown, although Colonel William Jackson Hicks of Raleigh and Albert Hicks of Richmond likely played a role in the design of all 5 warehouses. There is some postulation that Samuel Leary, Philadelphia architect who lived on Cleveland St. and designed such notable structures as the Foushee House, St. Joseph's, the Washington Duke building at Trinity College. 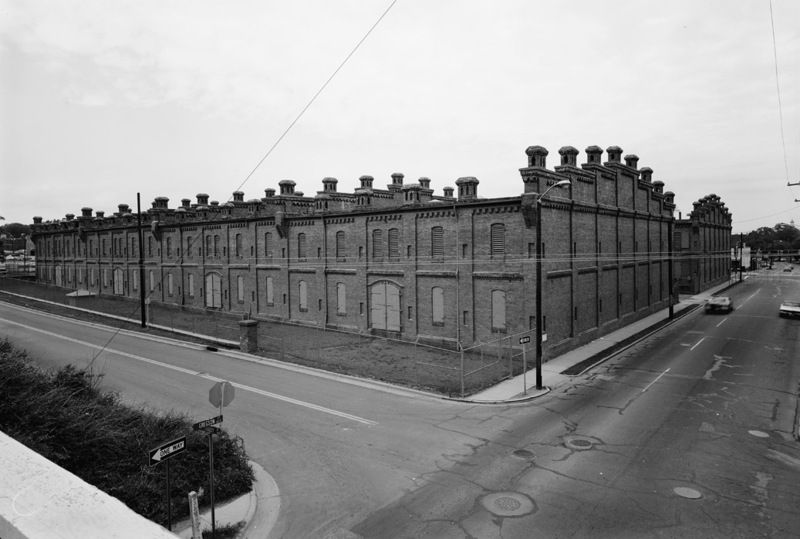 The warehouses were used - initially by the American Tobacco Company, and after the 1911 anti-trust breakup of the company, Liggett and Myers, for the storage of tobacco, kept dry through a series of ventilating chimneys. 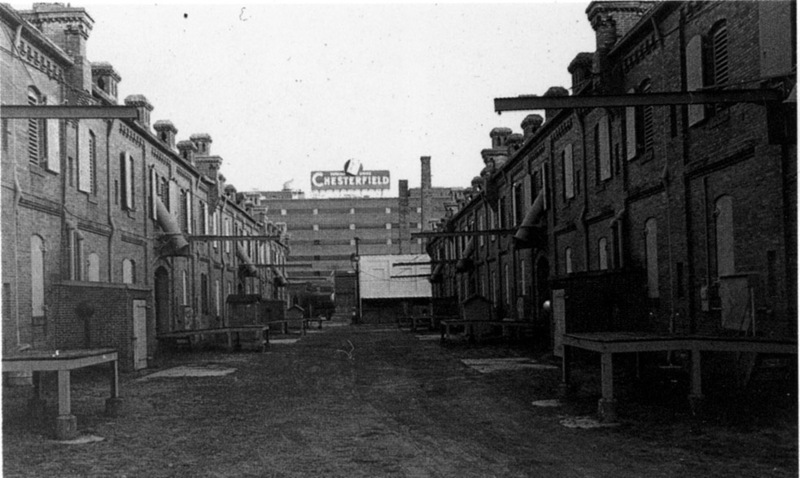 A view of the south side of the warehouses, looking west on Peabody St, 02.14.53. The warehouses were used by Liggett and Myers until 1970, when they were put up for sale. Watts and Yuille Warehouses, looking northwest from Peabody and South Gregson, 1978. Looking south from West Main St., 1970s. They were sold in 1980 to the SEHED development company, headed by Terry Sanford, Jr., for $400,000. Along with architect Eddie Belk, they began the first 'downtown's comin' back' project, investing $6.2 million renovating the warehouses as retail on the first floor and office space on the second floor. Early tenants such as Fowler's and Morgan Imports helped make the project successful and a 'proof of concept' of what could be done with fallow warehouse space in Durham. The initial configuration of the buildings, while innovative, reflected the accepted 'mall' ideas of the time. Almost all businesses were entered off of a hallway inside the building. Only Fowler's (where Chamas is now) had an exterior entrance. The central courtyard, although pleasant enough, was primarily a pedestrian walkway rather than truly multi-functional space. Lacking clear definition or order to the pedestrian space, building access reads as difficult with iron fencing and the stairway facing away from the entrance to courtyard. By 2004, even megamalls like Southpoint had embraced the idea of a streetscape. Ken Kauffman of Urban Retail Asssociates (who also worked on Union Station in DC) persuaded Sanford to revamp the courtyard and buildings such that the stores had exterior entrances off of the courtyard with outside dining and other 'street furniture'/lighting that made the courtyard into functional public space. The result (designed by landscape architects Coulter, Jewell, and Thames and architects Roughton, Nickelson, and Deluca) is a space that is far more pleasant, even vibrant on weekend nights when the weather is good. Brightleaf Courtyard, looking west from South Gregson, 2006.